We are delighted to announce an exciting and new collaboration with the renowned children’s medical research charity Action Medical Research. They are joining us in the quest to find treatments for myotubular and centronuclear myopathy. Since founding in 1952 Action Medical Research has been instrumental in funding medical breakthroughs. They have made groundbreaking changes in the health of children – from the first UK polio vaccines to developing the use of ultrasound technology in pregnancy. We are honoured that this highly respected children’s medical research charity has chosen to partner with Myotubular Trust, and that we are united in our desire to change the lives of those with myotubular and centronuclear myopathy. Applications must meet the remit of both charities and all outline applications will be judged in open competition on both potential clinical impact, and scientific quality. Applications may be made for project grants of up to 3 years’ duration, with up to £200,000 available. Principal investigators and applicants must be based at UK institutions and awards can only be made to UK institutions. Researchers from outside the UK can collaborate on UK-based projects if appropriate. Deadline for applications is Tuesday 21 November 2017. 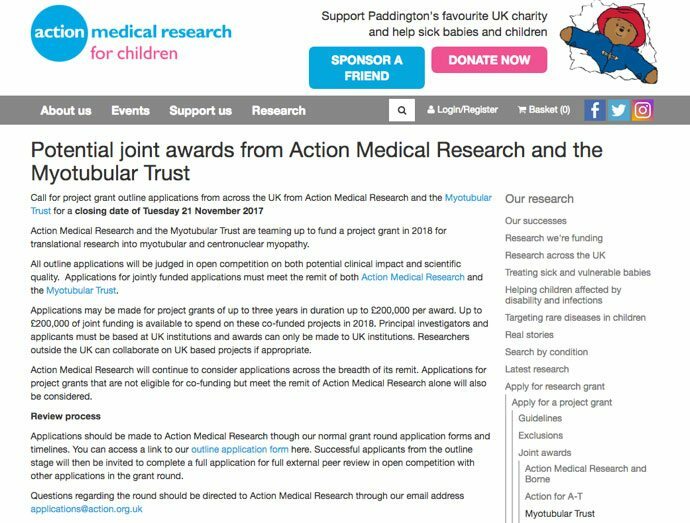 The application process will be managed through the Action Medical Research 2018 grant round and the outline application form can be found here. Successful applicants from the outline stage will be invited to complete a full application for full external peer review in open competition with other applications in the Action Medical Research grant round.